Fortnite is indisputably huge, and now it’s even invaded the world’s biggest sports competition. France’s Antoine Griezmann celebrated a goal during today’s final match versus Croatia by running to the sidelines and performing the ‘Take the L’ emote. Griezmann, a 27-year-old forward for both the French national team and Atlético Madrid, broke a 1-1 tie during France’s World Cup final match against Croatia at just before 38 minutes with a penalty kick. The successful kick gave France the lead at 2-1, and Griezmann immediately ran toward the side of the field, cheered on by his teammates. Once he reached the edge of the field, he cheekily broke out a pretty dead-on version of Fortnite’s goofy ‘Take the L’ emote in front of thousands of Croatian fans. Here’s our list of the best battle royale games for PC. Viewers were quick to notice the obvious reference to Fortnite, which has become a favorite game and cultural touchstone among professional athletes. “This dude Griezmann hit the fortnite dance in a World Cup final smh,” one soccer fan tweeted. 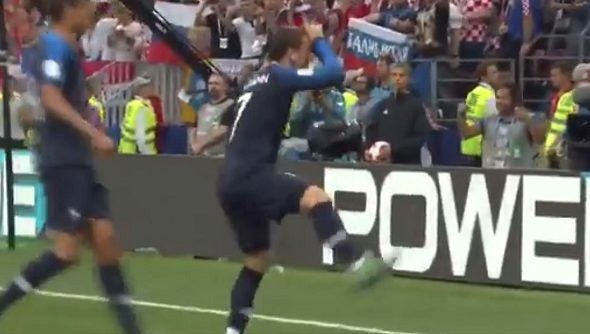 “Griezmann does the L Dance from Fortnite after scoring in the World Cup. Can you imagine being an executive at publisher Epic Games?” tweeted ESPN business reporter Darren Rovell. Here are a few views of Griezmann’s ‘epic’ celebratory emote. Antoine Griezmann has been clinical from the penalty spot for France. France went on to defeat Croatia for the 2018 World Cup title. It’s France’s second World Cup win, after their first in 1998.